Sage 50 is one of the most widely used small business accounting packages in the UK, but how do you know whether you have outgrown it? 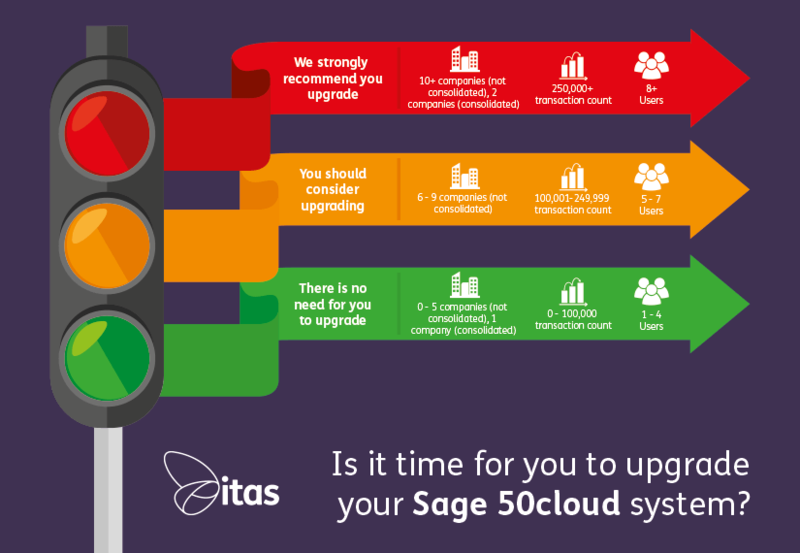 Use our traffic light infographic below to see if you’re due a Sage 50 upgrade. If you end up down the red path then you need to call up a Sage Business Partner urgently. Orange, you need to really consider upgrading soon. Green means you are fine using Sage 50 for your business needs at the moment. Based on recommendations from Sage and over 20 years of experience working with Sage software as a Sage Business Partner, this infographic was designed to provide a highly graphical guide to reasons you may want to consider upgrading. Using traffic light colours to identify the status of your system – red, yellow and green for those of you that don’t drive! Sage 50 is a great piece of software within certain parameters – if you exceed its limitations the system can become unstable and your system integrity compromised. Below I have broken down the above infographic into more detail so you can understand the factors that may indicate you have either outgrown Sage 50 or your Sage 50 system is at risk. →Do you have 8 or more users? →Do you have more than one company and need to consolidate either your accounts or reporting? →Do you have multiple stock locations? →Do you need more advanced foreign currency handling? →Are you struggling to get the reports and analysis you need out of Sage 50? →Is your system running slowly? →Do you need to assign and trace batch and serial numbers? →Do you need purchase order authorisation? →Is your pricing structure complex and hard to manage in Sage 50? →Do you need to break down your accounts by cost centre and department? itas have been a Sage business partner for over 20 years so you can trust in our vast knowledge and experience. We offer exceptional customer service at a competitive price and aim to make your transition from Sage 50 to Sage 200 as painless as possible! We support customers around the UK including London, Essex, Kent, Wales, Manchester, Birmingham, Leeds, Chester, and Peterborough. We hope you find it useful and please contact us if you have any questions or would like a Sage 50 Health Check. Home » Sage Blog » All Sage Blog Posts » How Healthy is your Sage 50 Software System?